Hey, Make This Exponentially More Awesome for Me, Okay? Option 1: $50,000 a week, increased by $5000 each week. Option 3: Start at $10 a week, increase by 10% each week. Most decided to focus on one year, and thus chose option 1. A few ventured out further and chose option 2. (Maybe next year I’ll make so option 2 overtakes option 1 just before year one instead of just after?) 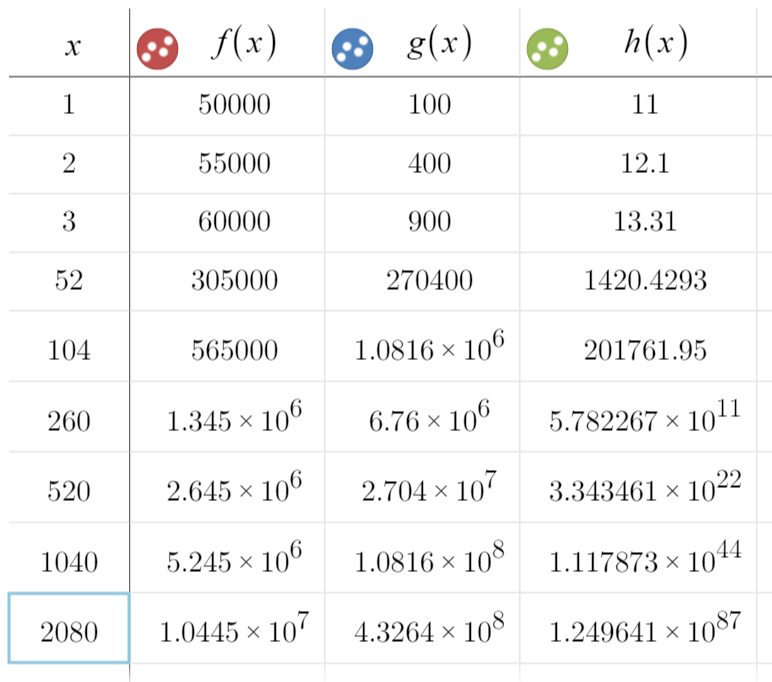 Most could not figure out an equation for option 3 (which didn’t bother me, especially when they haven’t seen exponentials in over a year), so just crossed that one out immediately based on the first few weeks. After each group gave their reasoning, we worked out a table on the board, starting with 1, 2, 3, 4, 5 weeks, then figuring out the equation for each week. I then gave each group a time frame-1, 2, 3, 5, 10, or 20 years and had them figure out the weekly salary for each option. The bell rang right in the middle of posting the results, but we still had fun talking about making $10^22! 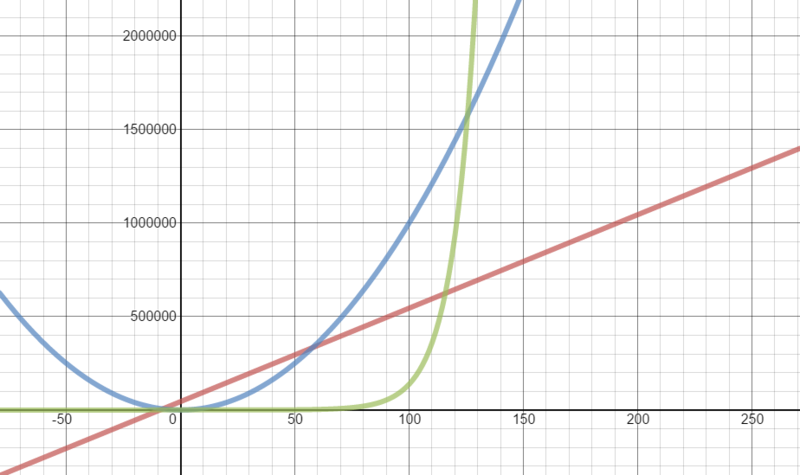 I mean, look at how slow both the linear and quadratic are growing. 10^8 after 40 years? That’s not even worth getting up in the morning for! I also wrote out the final numbers on the board while they were working on the next task, using all 87 zeros. Figuring out the time to switch by solving a quadratic (option 1 & 2) or by using technology–either Desmos or using Excel? Have them write an actual recommendation of which salary to chose and why. For the first couple of years, students were wondering if making so much at the beginning would make you have more money at the end of the year with the linear. What a perfect way to bring in area under the curve! Especially because they could actually calculate the linear function’s area with just one trapezoid, then I was thinking just to use the integral function on the TI for the other two. So this post is serving as my reminder to myself to devote some days to this next year, and try to do some of these extensions. But if any of y’all want to try it out and make it awesome as you are wont to do, please do and report back! I’ll be chillin’ with my cool $10^87.